MELKSHAM’S Person of the Year 2015 award has been won by Anne Cranham, the chair of Broughton Gifford and Holt Scout Group. Hundreds of votes were received in the competition, which was organised by Melksham Independent News to find the person who had the biggest impact on life in the Melksham area during 2015. Anne finished the polls ahead of five other candidates. Anne was nominated for having volunteered at the Scout group for 37 years, and was described as the backbone of the group. In 2015 she helped raise funds to replace the Scout group’s tents, organised a Beavers’ sleepover at Boomerang, and took the group to summer camp. She is also captain of a ladies’ skittles team in the town. Anne said, “I’m amazed to have won! I don’t know how to thank everybody enough for voting for me – I didn’t expect to win at all. “After I was nominated I had some really lovely comments from people, and even heard from people in Australia who had read the article. “I don’t do any of what I do for recognition; I do it because I enjoy it and to see children have fun and get new opportunities makes it all worthwhile. 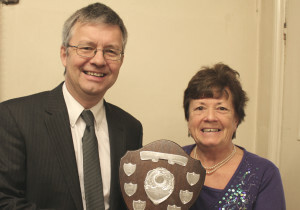 Ian Drew, editor of Melksham Independent News, presented the winner’s shield to Anne last week. Ian said, “Congratulations to Anne on winning this year’s Person of the Year Award. She is a deserving winner; to have volunteered for so long is extraordinary and clearly the people of Melksham appreciate the work she does in and out of the Scout group. Other nominees were Terry Chivers, Wiltshire councillor for Melksham Without; Naomi and Gavin Owen, founders of Core Church and organisers of the town’s free Christmas lunch; Darren Perrin, Melksham Town FC’s manager who oversaw the club’s best ever season last year; Brian Warwick, founder and chair of Melksham Seniors’ 55+ Forum, and campaigner for ageing people’s support; and Miriam Zaccarelli, Melksham’s deputy town clerk who supports numerous events in the town in her free time.